At least 30 prisoners and 10 guards have been killed in a prison break in Iraq, as more than 50 other inmates escaped, officials and police say. The Islamic State (IS) militant group says it was behind the attack on the jail in Khalis, north-east of Baghdad. But officials blame the incident on a prison riot in which inmates tried to seize weapons and managed to break out. Iraq has seen a number of prison breaks. Many have been caused by militants seeking to free comrades. Nine of the inmates who got away in the latest incident were being held on terrorism charges, including IS members. The rest, officials said, were common criminals. Police officials said the trouble began when prisoners started fighting, and guards who intervened were attacked and had their weapons seized. The ministry said there had been no external assault. A security official told the BBC that some of the prisoners had planned the escape. But the militant group has said it was behind the attack and managed to free "more than 30" fighters from the prison in a statement posted online. "Fifteen IEDs (improvised explosive devices) were detonated against army and police convoys and vehicles around the prison," the statement added. Some local sources also reported Islamic State militants using several vehicles to try to storm the prison and release its members inside. 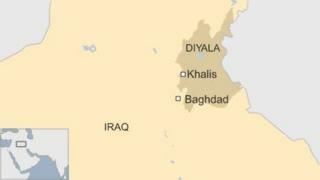 The town of Khalis is located in Diyala province about 80km (50 miles) north of Baghdad. A curfew is now in place in the city and in two of its suburbs as security services comb the area in search of the suspects, the mayor of Khalis told the BBC. Grisly pictures have been circulating on social media, with some commentators suggesting a massacre took place at the prison. The Iraqi government is battling IS militants who have captured large parts of the country. This is the third such jailbreak in Diyala since last June, when IS seized large territories in north and western Iraq as the regular army troops partly collapse. Over 500 inmates, including leading Islamists, escaped from the Abu Ghraib prison west of Baghdad in 2013 after gunmen stormed the facility. Separately on Saturday, a car bomb killed at least seven civilians and injured 14 others in Baghdad, police said. Shia pilgrims embarking on an annual march to a shrine in the capital were believed to have been the target.